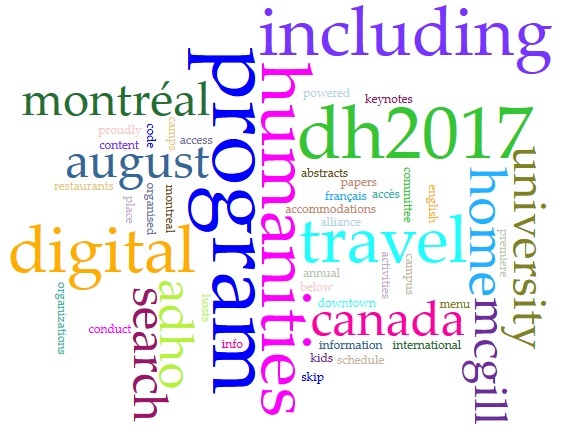 Co-organised by McGill University and the Université de Montréal, DH2017 will take place August 8-11, 2017 in downtown Montréal, Canada on the campus of McGill University. This is the premiere annual conference of the international Alliance of Digital Humanities Organizations (ADHO). 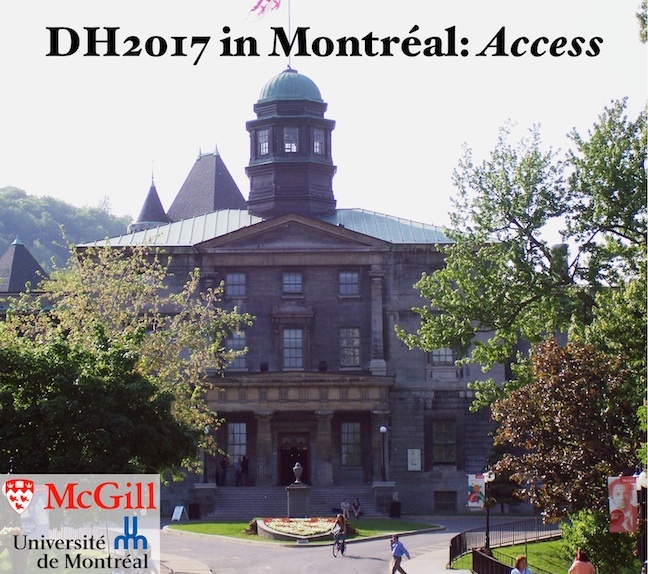 The theme of DH2017 is “Access/Accès”. The Alliance of Digital Humanities Organizations (ADHO) is an umbrella organisation whose goals are to promote and support digital research and teaching across arts and humanities disciplines, drawing together humanists engaged in digital and computer-assisted research, teaching, creation, dissemination, and beyond, in all areas reflected by its diverse membership. ADHO supports initiatives for publication, presentation, collaboration, and training; recognises and supports excellence in these endeavours; and acts as an community-based consultative and advisory force. 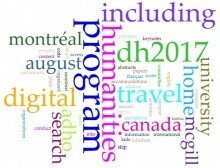 In doing so, ADHO embraces and coordinates activity across its constituent organisations: the European Association for Digital Humanities (EADH, founded in 1973 as the Association for Literary and Linguistic Computing), the Association for Computers and the Humanities (ACH, founded in 1978), the Canadian Society for Digital Humanities / Société canadienne des humanités numériques (CSDH/SCHN, founded in 1986 as the Consortium for Computers in the Humanities / Consortium pour ordinateurs en sciences humaines), centerNet, the Australasian Association for Digital Humanities (aaDH), and the Japanese Association for Digital Humanites (JADH). Members in ADHO societies are those at the forefront of areas such as textual analysis, electronic publication, document encoding, textual studies and theory, new media studies and multimedia, digital libraries, applied augmented reality, interactive gaming, and beyond. We are researchers and lecturers in humanities computing and in academic departments such as English, History, French, Modern Languages, Philosophy, Theatre, Music, Computer Science, and Visual Arts. We are resource specialists working in libraries, archival centres, and with humanities computing groups. We are academic administrators, and members of the private and public sectors. We are independent scholars, students, graduate students, and research assistants. We are from countries in every hemisphere.